Robots have been around in one way or another even before 50’s sci-fi movies made them popular. Since then robots have been evil villains in movies, lovable characters in TV shows, and even wise cracking comic relief in cartoons. The timeless robot costume is always a good choice whether you spend a day before Halloween spray painting cardboard boxes, or 5 months creating a giant handmade costume. We’ve gathered some awesome robot costume ideas to get your creative circuits flowing. Make blogged about a giant robot costume that took 5 months to build and cost over $900 in parts and research. 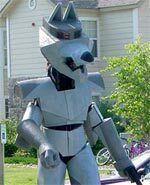 It looks pretty awesome at a towering 9’2″ tall (costumer wears stilts) and even has some good detail with a little bug that seems to control the robot. Over at Instructables you can view how to make another giant robot costume, but this one is made of recycled materials. He built this one out of laundry detergent bottles, crutches, football shoulder pads, and lots of hot glue. This style is our favorite because it really lets you flex your creativity to come up with your own ideas. You can recycle, paint, or glue on anything that feels robot-y to you. If you are more of a square and boxy type robot fan, then cardboard boxes are a good and inexpensive choice for a robot costume. I found a page where a group of college kids show us how they made their robot costumes. You can get some more great ideas for cardboard built robots from flickr. This one uses the standard boxes, duct tape, foil, and throws in some fake gauges and warning symbols for an overall robotic effect. This one added used CDs for eyes and added eyebrows to get a more evil robot look. This one used reflectors for eyes, and what appears to be an off the shelf tap light and lots ‘o’ foil. A good amount of DIY robot costumes have some type of dryer vent tubing or similar material for arms. These are a simple and easy choice because they are inexpensive, easy to find (local home improvement store), and already a shiny metal looking color. Another good and easy accessory is tubes or wires going from one spot on your costume to another. You could even try integrating some old circuit boards from broken electronics onto your box to go for the exposed innards look. A lot of the items listed above can be found in your own neighborhood on trash day. Or if you are in a populous city you can check out the free section on your local Craigslist for some costume materials. Of course we encourage you to get creative and try different colors, shapes, and sizes. Feel free to paint your face silver instead of putting a box over your head all night, or wearing gloves so you can carry around your drink at the Halloween party. Make it your own, with your own style and remember to think about what you’ll be doing while you are in the costume. And don’t forget to brush up on your robot dancing skills. Did you make a robot costume? Did you find useful pictures or tutorials online? Please contribute your findings in the comment section below.